Islamic State militants across Iraq have proven to be a formidable force: experts in a hybrid of traditional and guerrilla warfare against their enemies, while terrorizing civilian populations under their control. But a combination of economic sanctions, relentless coalition airstrikes and Iraqi army attacks are cracking IS's armor. Families escaping through the chinks describe how IS wages war. Ahmed Saleh Mohammed sat on a thin foam mattress in the concrete room he calls home in this refugee camp. Looking at his mother, brother and children, he gestured at the walls as he described the night the war against IS arrived in his village. "Imagine the situation: a room this size with 60 people, my family, my brother's family, my cousin's family, and there is bombing, and we are ducking down because there are bullets coming through the windows and through the walls," he said. U.S.-led coalition fighter jets have been bombing IS areas for 20 months, and recently turned their firepower to the area around Mosul as the Iraqi army launched a now-stalled offensive to retake the city from IS in March. Some villagers were caught in the crossfire. "IS has an execution brigade for anyone who abandons their post," Saleh Mohammed said. It acts as powerful incentive for IS foot soldiers to stand their ground even in the face of coalition bombs. FILE - Iraqi soldiers fire a rocket toward Islamic State militants on the outskirt of the Makhmour south of Mosul, Iraq, March 25, 2016. The airstrikes did give cover for some of these refugees to escape; others were freed by the Iraqi army. In all, about 6,000 — most of them women and children — have fled the recent fighting. But some of them said IS has a series of fallback plans for when Iraqi ground forces advance. Saleh Mohammed said the group is using female suicide bombers as bait. "When the army started liberating the city, they sent these women toward the Iraqi army to call for help, saying, ‘Free us from IS.' Then, when they are near the army, they blow themselves up," he said. "They are IS wives, and not from my village, but sent by IS to blow up the village." Other male refugees said they, too, had seen suicide bombers dressed in the head-to-toe black covering used by women, but could not confirm they were women. These men were part of a cluster of sunburned refugees standing outside the camp mosque. Most refused to be photographed, fearful of what IS would do to relatives left behind. But they were eager to talk about what they had seen. Each village, they said, has an IS presence. Sometimes they take over a house in the middle of a village and use it as a hub, well aware that any bomb attack would kill nearby families. At other times, they move in with a family. "You cannot refuse IS. If they want to get into your house, they get in," said one student who would only give his name as Ahmed. "At one point, they were shooting next to my house and I went outside and asked them to stop and they started shooting at me. My mother pulled me back in the house and saved my life." IS militants have also created an inter-connected network of tunnels under every village, giving them a place to hide when the area is bombed, and a fast way to move between houses. So even if the Iraqi army takes a village, the refugees said, the soldiers will have a hard time holding it. "The night the army came to liberate us, some IS went back to their tunnels," said one man, as others called out in agreement. "IS would then come out of the tunnels at night and start attacking the army." Arif, a former Iraqi military commander who also escaped, said the tunnels were built by IS prison labor or those desperate for money. That way, he said, if the tunnel-diggers were bombed, IS did not lose any fighters. "Only Iraqis were forced to dig the tunnels," Arif said, adding that the foreigners he saw were confined to the leadership of Islamic State. Others joined in, adding that the foreigners came from countries such as France, Russia, Algeria, Morocco and Afghanistan. The refugees also said that even prior to the Iraqi army moving in, IS started to lay bombs. "They booby-trap houses. They booby-trap even the streets, even the fields," said one man. 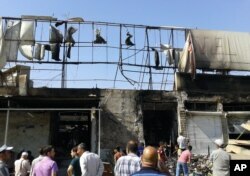 FILE - People inspect buildings damaged by an Iraqi government airstrike in the northern city of Mosul, Iraq, June 28, 2014. All agreed that what IS hated the most were the airstrikes, which they said overall were "usually very accurate" in targeting the militants. For those trapped in the villages, the worst sound was not the fighter jets, but the silence. "When we don't hear planes, we get nervous," Arif said. "As soon as we don't hear planes, immediately IS starts reinforcing supplies, weapons, food and bombs. It's a strange battle and we are caught in the middle with no escape." An older teacher with white stubble on his chin, clasping a lined children's notebook in his right hand, waded into the crowd. At first Yassim's message seemed to be one of hope — that life eventually could return to normal in Iraq. "There is a blessing from God that is forgetfulness, and we have faith in our future. It will always be a black memory in the back of our heads, but we will forget it," he said. But then he added, "This was all caused by the Iraqi government." It was a reminder of the deep sectarian hatred and blame games that still exist in Iraq. Iraq's majority Shi'ite government became increasingly repressive after U.S. forces left in 2011. IS exploited that oppression, marketing itself as a defender of the Sunni population. And even though this latest wave of refugees from IS acknowledged that IS militants were hiding in their houses and shooting Iraqi forces from their villages, they had little good to say about the army that liberated them, accusing them of torturing villagers and destroying their property. All sides in the Iraqi conflict have been accused of human rights abuses, although none have rivaled IS for sheer brutality.